Wagner, whose company has been providing medical coding solutions since 2002, had discovered offshore coding wasn’t the panacea it seemed to be at the beginning of the ICD-10 transition—a discovery that might have gone unrealized if not for a chance conversation in 2017. “I was approached by AHIMA leadership at the national convention in Los Angeles in 2017. They had mentioned they were being challenged to take a position on offshore coding. In order for them to take a position, they were looking for any kind of study or analytics that had been done on offshore coding compared to USA domestic coding,” Wagner says. “Well, I have all of that,” Wagner told them. At the time of that informal conversation, KIWI-TEK had ceased employing offshore coders for about a year, but it had previously had a robust offshore workforce during the ICD-10 onboarding years. Wagner began thinking maybe there was an important story hiding in KIWI-TEK’s coder performance reports. Thus began the data mining that would become the study presented a year later in Miami. Even he would be surprised by the story the numbers told. There is no coder shortage in the United States. 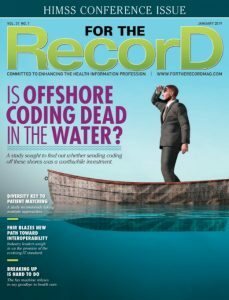 How Should You Invest in Medical Record Coding?